Back in February we took the decision that a bike computer would be a useful addition to our set up as we were having a hard time guessing how fast we were going and thus how long it would take to get somewhere. At one point we were pacing ourselves with passing mopeds and asking the drivers what speed they were going. The computer would also allow us to record our distances covered, average speeds etc and Annie took a very diligent record of that. First up is our an overall chart showing the distance we cycled every day for the entire year. It varies a lot, but the average is just below 65km. We got our top day in the flat deserts of Turkmenistan when we needed to get across the country in 5 days. Northern Iran and Armenia were pretty mountainous and we were not in a particular hurry during that leg of the trip so we were taking our time there. The spread of days is interesting and the biggest factor it shows up the terrain and road surface quality of the countries. Next is the actual time we spent in the saddle each day. This came out surprisingly low, but we had quite a few short days and also we tend to stop and look around a lot…I think other cyclists, particularly solo cyclists, will spend longer in the saddle. But we tend to stop regularly. Lunch can also drag on a bit, sitting in our comfy chairs drinking tea and staring at the ants processing our crumbs. Towards the end of our trip we had time to kill in Armenia and Turkey so that shows up here. What I did think was that it is unsustainable to do 5hr + days for more than 3/4 days without one of us running our of steam and needing a long break. It is a lot of energy to burn up and a lot of food and sleep is needed to keep sustaining that level of effort for a longer period. I am sure it is possible, but we were also out to enjoy the scenery! By the end of the trip we used time on the bike to measure the ‘toughness’ of a day. Everyone always asks how fast we go. Well here is our answer: 16km/hr. We can tip along at 22/23km/hr on the flat and that is what the tandem is made to do – a slight downhill or flat with a tail wind and we can really get the momentum going. However going up hills at 4km/hr is not unheard of. The other question we get asked it whether it is easier or harder on the tandem. We don’t know for sure since we haven’t done anything similar on two bikes, but we suspect the tandem is easier. Top speed of the trip was 69km/hr. Vrooom! Above is a graph of the distance covered in each country. The information speaks for itself and is really a factor of how long we spent in each place and how long we could get on our visas. A rule of thumb often used is that to cycle tour 1000km will take approximately one month and that is pretty much true for us. We can do more for example in China we just couldn’t get enough of it and we covered 2600km in two months, but in Iran we spent a lot of time looking at stuff and meeting people so we did just 800km in a month. The days cycled in each country – this speaks for itself. The only country where we cycled every day on our visa was our mad dash across Turkmenistan. We planned our trip to cycle 4 out of 7 days each week and that roughly worked out to be what we did. Lastly the ride time in each country. Our wheels saw a lot of China, Kyrgystan and Tajikistan and that was where the big mountains, big scenery and remote cultures were – no coincidence there! We realised early on we loved climbing big mountains and now that is what we go looking for on the map. Roll on the Alps! Pindaya: Spectacular caves or just a spectacular rip off? After our luxurious day of eating and drinking and being taken around the lake yesterday on the boat it was time to get back on the bike again and head north, our final destination being Mandalay on the 21st. Our first leg would be the 61km to Pindaya where there is a large cave complex filled with thousands of Buddhas. There is a steady but very manageable incline out of Nwyngshwe and then a flattish plateaux at the top. We meet some cool Americans at the turn off and stop to chat for a while. We have a very strong headwind in our faces which makes the cycle a bit gruelling from there on but the scenery is very nice. 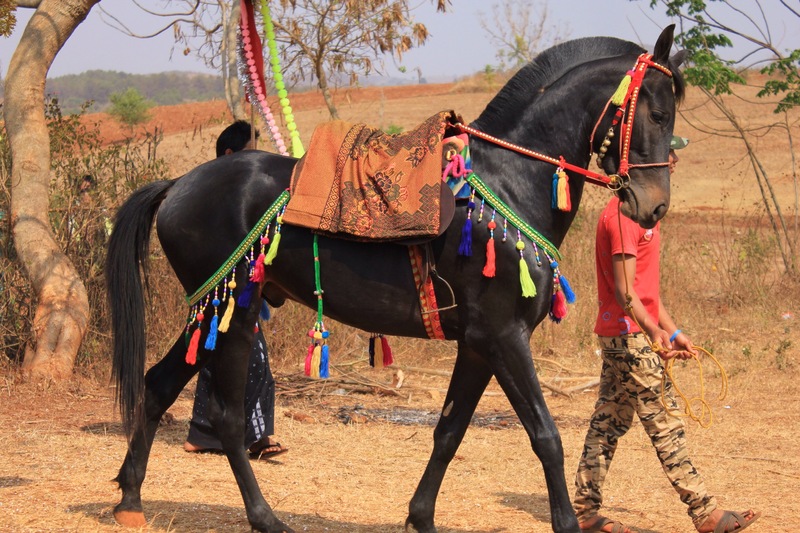 We pass an extravagant ceremony taking place off from the road so we decide to stop to take a closer look. It turns out to be an initiation ceremony for 8 local boys who are about to embark on their first stint as a Buddhist monk. Some of the boys are tiny (5-6 years old) but they will probably only stay at the monastery for a few nights. The whole town has come out to either take part in the ceremony or to watch. 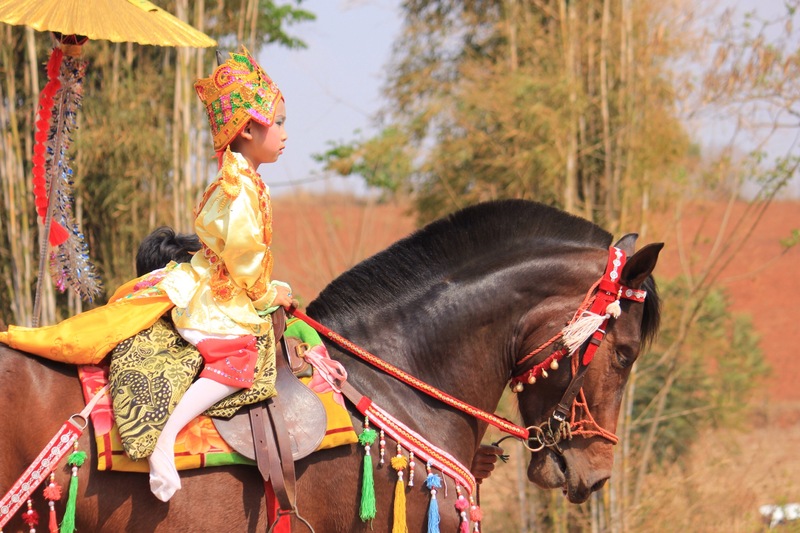 All the boys are dressed in colourful outfits and headdresses and mounted on beautifully groomed horses, flanked by golden parasols. 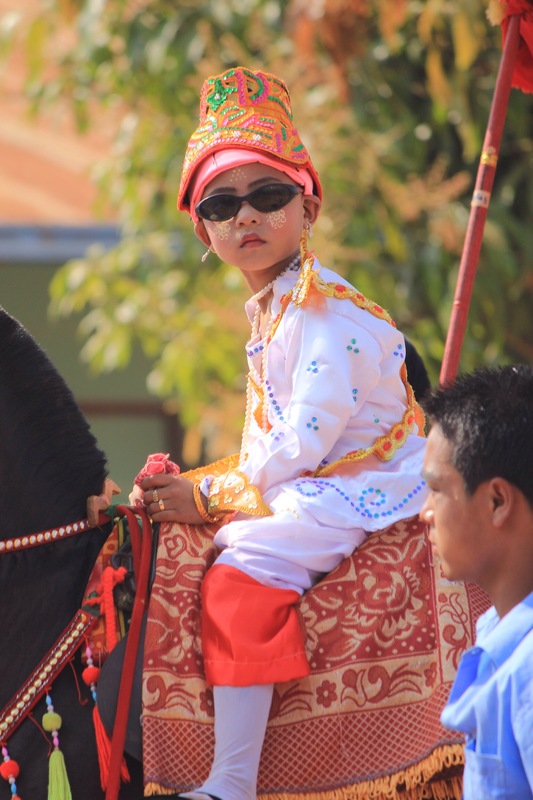 A riderless horse leads the boys; the vacant seat signifying the presence of the Buddah. 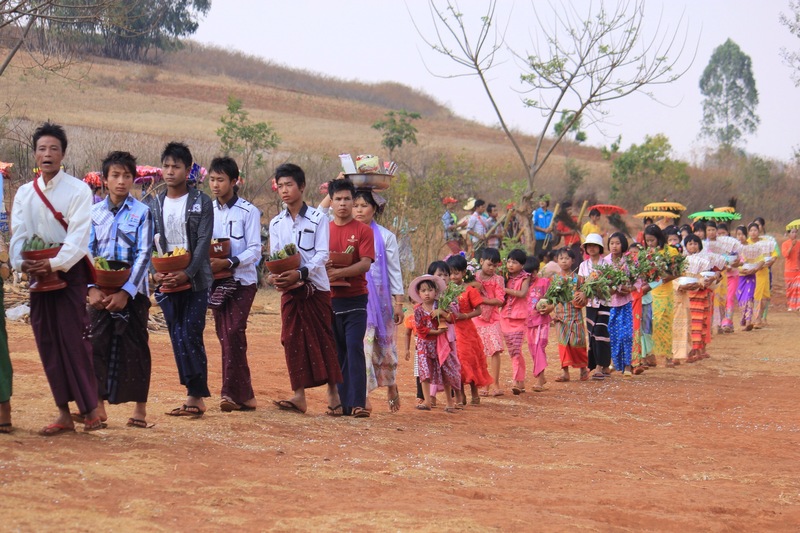 A long line of offerings carried by groups of young people (money, blankets, flowers) proceeds the boys. 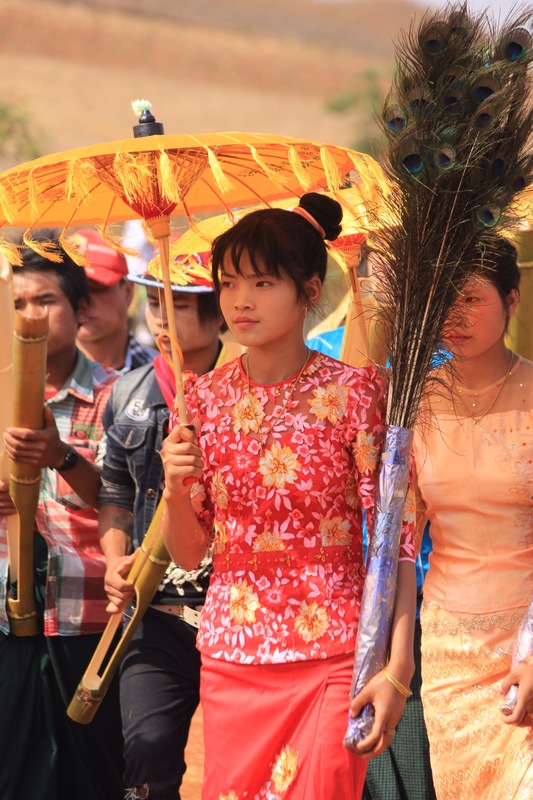 Four young women carry a plume of beautiful peacock feathers and a parasol and are apparently the teenage girls who will this year ‘come of age’. The long line of people makes a circuit around the village three times accompanied by live musicians. We reach Pindaya which, is set around a large lake, at around 4pm. It’s very pretty and is a town which is clearly doing well from the tourism. The only problem with Pindaya is the serious lack of affordable accommodation the cheapest we could find was $20 dollars with no breakfast. It is a true tourist trap and a cheap meal is also hard to come by… To top this off tourists also have to pay a $2 fee just to enter the town!! This would be like towns such as Falmouth, Cardigan or Harrogate starting to charge tourists £5 on their way in. The cave is 3000 kyat to enter (hide your camera so you don’t get charged the additional 300 for that). I guess the cave complex is impressive but it’s very set up for visitors and is so lit up by lights that it lacked any real sense of wonder or mysticism for us. Having blown our budget on everything else the 20 mins we spent wondering around the statues just didn’t seem worth it really! If you are strapped for time or are trying to save the pennies between the inevitable money traps of Inle and Bagan/Mandalay, we might suggest to leave Pindaya off your itinerary. The issue is the cycle between Inle and the next hotel in Ywengan which would be a long day… Possible if you are in good shape or only semi-loaded. If you have a tent definitely camping would be an option. Please note that this information was posted in 2016. We obtained visas for all these countries. Yes! That’s right, me a British citizen cycling got a visa for Iran!! If you want more info on this please read this here and then leave a comment and your email and we’ll contact you. It’s a good idea to ensure that you have at least 6 months validity on your passport when applying for all visas. Take a stack of passport photos with you for your visa applications and always keep your departure forms safe. Women need some passport photos with their head (no hair showing) covered for Iran. If you are quitting your job before leaving its also a really good idea to steal some company headed paper (preferably stamped at the bottom if your company has an official stamp). Visa applications may need proof of employment so having some company paper to print onto is a good idea. If you’re not taking a laptop we would advise mocking up some simple documents such as a basic letter and cv formats which you can edit easily. On 22 June 2015, the Embassy received the formal notification that the Government of Viet Nam decided to exempt visa for British, German, French, Spanish and Italian citizens travelling to Viet Nam (for all purposes) for a period of up to 15 days, and on the basis of meeting all conditions prescribed by Vietnamese laws. Applying for a loose leaf visa which doesn’t require sending your passports in is possible. Bavet, Kaam Samnor and Phnom Den crossings are open to foreign travellers and issue Cambodian visas. The other border crossings at Trapeang Phlong, Prek Chak, O Yadaw and Trapeang Srer are reported to be open to foreign travellers and in some cases issue Cambodian visas. You would think that Thailand would be the simplest visa situation but the rules regarding border crossings and visa exemptions make it more complicated for cycle tourers and we have the added complications of needing a multi-entry visa for Thailand. Passport holders from 41 countries and 1 special administrative region – Hong Kong SAR – are not required to obtain a visa when entering Thailand for tourism purposes and will be permitted to stay in Thailand for a period not exceeding 30 days on each visit. If such foreigners enter Thailand at immigration checkpoints which border neighbouring countries (overland crossing), they will be allowed to stay for 15 days each time. Since 20 December 2013, Nationals of (G7) the following countries who enter via a land crossing or enter via an airport will be entitled to a 30 day visa exemption, UK, U.S.A, Canada, Italy, Germany, Japan, France. Foreigners who enter Thailand under the Tourist Visa Exemption category and would like to leave and re-enter may only stay for a cumulative duration which does not exceed 90 days and is within a 6-month period from the date of first entry. Foreigners entering Thailand by any means under the Tourist Visa Exemption category are required at the port of entry to have proof of onward travel (confirmed air, train, bus or boat tickets) to leave Thailand within 30 days of the arrival date (otherwise a tourist visa must be obtained). If we need to stay longer than 15 days we need to apply and pay for a Tourist Visa for Paddy – we won’t have proof of onward travel either – which probably means applying for a Tourist Visa before we reach the border. Extension Possible: yes for both types but need to be applied for at the Immigration Bureau located in Bangkok. It is possible to apply for tourist visas for Thailand (circa $40 for a 60 day double-entry) in Phnom Penh, Cambodia. This takes 3 days. Siem Reap looks like it is possible via an agent who has connections with the embassy in PP but would require us to send our passports to PP. Might be safer to do it when cycling through PP. Arriving and departing across land is definitely possible. When travelling over land to Myanmar, you must always obtain your visa beforehand; it is not currently possible to get Myanmar visas at the border and e-visas are not valid for border crossings. The Visa Section is now open for applications only from 9:00 AM to 12:00 Noon. Afternoons 3:00 PM to 4:00 PM are only for pickup. Bring your passport, a photocopy of your passport, 2 passport photos and an address of where you will be staying in Myanmar. Blog on getting to china on bicycles. Our experience of applying for a Chinese visa in Bangkok. Our experience of crossing the border between Myanmar and China (Muse) – check out the comments from other cyclists at the bottom too. Will require bank statement and other proof documents. You apply in in Bangkok via the Embassy and the Bank of China. Takes at least 4 days. Need proof of $100 for each day of your visa. Kyrgyzstan – free 60 day visa on arrival! Tajikistan including GBAO permit – one day $55 in Bishkek – easy! Turkmenistan – see our blog here re applying in Bishkek and experience with the e-code. Packing light and buying the right gear for the particular conditions we will be facing has been an important and really exciting part of our planning. We have spent MANY hours researching and buying our gear and we’ve enjoyed doing this together. It seems not all cycle tourers invest in brand new, lightweight gear. In their blogs, many claim to have invested in a good set of panniers and not much else. You don’t need to spend a huge amount of money but packing light has been important and a huge advantage for us. 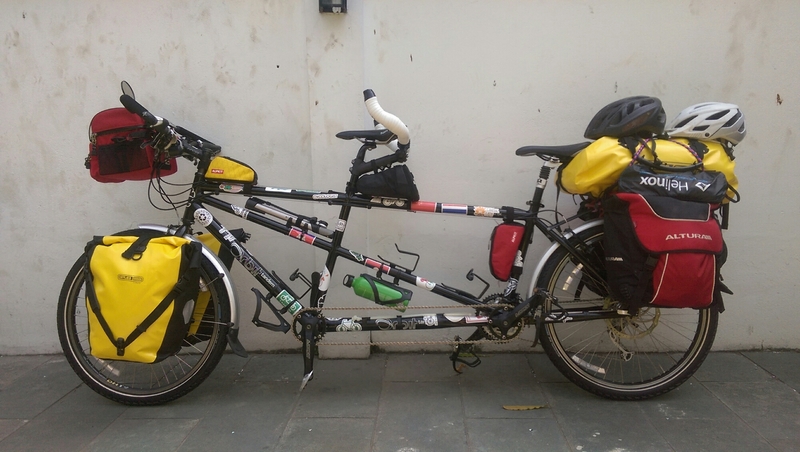 Deciding to travel by tandem means you are seriously limited for space especially if you decide that taking a trailer isn’t for you. We are really excited at the prospect of getting rid of all our possessions for a year but I’m sure there would be many ultra-light tourers who would look at our list and scoff! I guess it’s about finding what’s right for you. For example, having a good tent set up and being comfortable while camping is important to us. Some may say our travel Helinox chairs were a ridiculous luxury but we know that we will value relaxing in them after a long day of pedalling (read our review here). We have planned our trip over a series of months and we couldn’t have done it without the range of blogs, reviews and online articles that have already been written by other cycle tourers online. The list below is another small contribution to this ever growing online resource – we hope it’s helpful to future tourers. We have also tried to talk in person to other cyclists who have done similar trips already – being members of warmshowers.org has been a great way to do this! Would have made a 100% cotton Longhy to use as a towel instead which also would have doubled up as a long skirt for visiting temples. I need more warm base layers for China and the stans – Helly Hanson is the best. A great bag (solid, completely waterproof) and would recommend over ortlieb especially if you are on a tandem – we got the biggest size and hold a lot of stuff in it. What’s very useful is it has zips instead of clips which means you can padlock any unneeded valuables (e.g kindles) while you go off without the bike to do a two day hike etc. Front pocket: snacks, pen, bike keys, small padlock (useful for locking bag when handed into ‘left luggage’ at a hotel/hostel. 1 scrubber/scraper, 1 lighter, 1 matches, 1 tea towel, 1 pen knife, 1 kettle, 1 pots, 1 frying pan, 2 plates, 2 x cups (Summit), chopping boa, serrated knife, peeler, grater, scissors, tin opener, wooden spoon, spatula, knives, forks and spoons. Salt and pepper, spices, hand sanitizer, washing up liquid, plastic bags, tuppawear box, elastic bands, bag clips.